Your job doesn’t stop until your customer’s purchase is in their hands. Unfortunately, most ecommerce shop owners consider shipping to be fairly foolproof and don’t monitor it. That can be risky! We analyzed 9,600 shipments from Q4 2018 to help explain why. Let’s define a few terms. Shipping exceptions can be for a variety of reasons, such as a delay, a shipment being held because it couldn’t be delivered, or a bad address. Not all exceptions mean that a package can’t be delivered but they are significant problems. Shipping carriers also flag failed delivery attempts. They will typically try to deliver a package up to 3 times, then hold it at their office for pickup for a week or so before being returned to sender if not picked up. So, while failed attempts aren’t immediate problems, they can be if a package gets several of them. Which carrier is the most reliable? What are the differences between shipping within the US and internationally? Overall, we found that 1.2% of shipments are flagged with exceptions and 2% have failed delivery attempts. We excluded shipments to India because they had a much higher rate of problems than every other country. Shipping within the US is pretty good and the US Postal Service is the most reliable, having the fastest shipping with the fewest problems. We recommend using the USPS if you can when shipping from one place in the US to another. They have the lowest shipping problems rate and the fastest shipping. We suspect the higher rate of problems of UPS is due to more of their packages requiring a signature. Interestingly, there was larger-than-expected variation between states. Check out these states which had shipping exception rates over 1%..
We recommend keeping an extra eye on packages to these states. Also consider getting insurance on packages to the worst states..
It’s no surprise that shipping from China takes longer, although we were surprised that 5% of packages take longer than a month. Make sure to be up-front about shipping times and keep your customers informed about their order’s progress to help prevent customer service requests or returns. 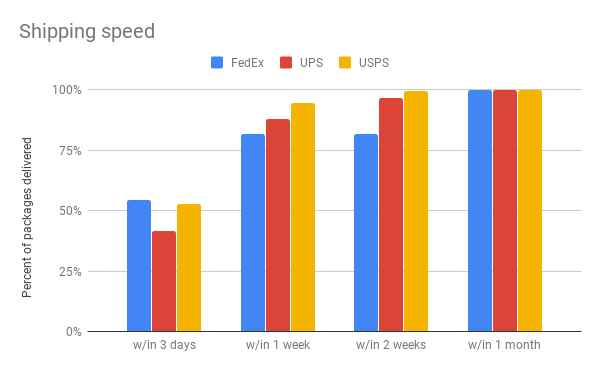 We also see an overall 1.4% shipping exception rate and a 2.2% failed delivery attempt rate, both of which are higher than shipping within the US. This makes sense, there’s more time for things to go wrong when shipping internationally. You need to know what shipping times to expect when selling internationally. 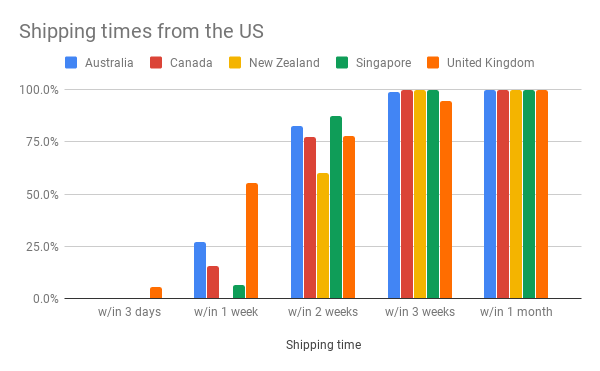 It’s not surprising that it’s typically faster to ship to closer countries. However, we were surprised that Singapore had the highest rate of shipments delivered within 2 weeks. We had to exclude India from the rest of the analysis because its 27% shipping exception rate and 12% delivery attempt failure rate were so much higher than all other countries that it skewed the data. We recommend that you don’t ship to India. Use the USPS when shipping in the US if it’s available for the class of service you need. Be up-front with your customers about shipping times to their country. Choose the countries you see to carefully. For example, don’t ship to India. We’ll be updating this analysis quarterly, so sign up for our mailing list to get updates. It’s also clear that you need to be on top of your shipping situation. An app like ShopClerk gives you a dashboard so you can understand it, and only ShopClerk gives you email alerts when something goes wrong. Why should you watch your shipping? Sadly, not every package gets safely to its new home. Each shipping problem means you might need to replace the order if its gone missing, or the customer will return it because it’s late. Many people order gifts without planning for enough time for shipping, and oftentimes buy a backup gift if their package doesn’t arrive by their deadline. Keeping an eye on your shipping reduces customers calling or emailing you about their packages and helps you provide better customer service by being proactive instead of reactive. Check out ShopClerk Order Tracking for Shopify. We offer a 14-day free trial and a generous free plan for up to 125 packages a month.